INDIANAPOLIS — On Saturday afternoon, November 17, several hundred attendees at the Percussive Arts Society International Convention (PASIC) were treated to a workshop and performance by the 2018 Boston Crusaders percussion section. The event took place at the Indiana Convention Center in Indianapolis, next door to the DCI World Championships home of Lucas Oil Stadium. On an annual basis, PASIC features well over a hundred concerts, clinics, master classes, and other sessions spanning the entire gamut of percussion. Three halls full of exhibitors featured marching, rock, jazz, concert, and ethnic instruments, sticks and mallets, multiple genres of sheet music, recordings, and anything and everything percussion-related. 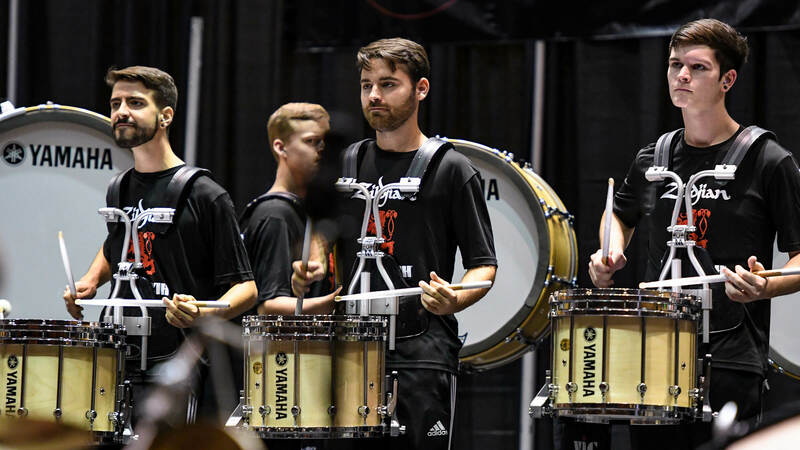 The Boston Crusaders percussionists knew well in advance of PASIC that the line would perform at the convention for the first time in the corps’ history. McNutt said that performers utilized Facebook to keep up their training post-season with video assignments in preparation for November. The complete percussion section of eight snares, five tenors, five bass drums, 17 front ensemble percussionists, and two drum majors had a single six-hour rehearsal the day before the performance, plus a two-hour brush-up the morning of the main event. Led by McNutt and front ensemble director Iain Moyer, the ensemble’s presentation, “A Day in the Life of a DCI Percussion Section” focused on the corps’ 2018 “S.O.S” production; how it was constructed, taught, and perfected. Attendees were exposed to the techniques and methods the Boston Crusaders staff utilized to teach the skills necessary to perform the show. The event ended with the ensemble playing through its entire “S.O.S.” production without pause, delivered with a precision that captivated those in the audience. “It’s been great for the students to have this experience, to learn from all the other clinics and to show off our drum corps activity,” McNutt said. The performing students were able to attend the convention at no cost to themselves, with airfare, hotel, and meal expenses covered through the generosity of others. Corporate sponsors included Yamaha, Remo, Zildjian, Vic Firth, and the corps’ parent organization, Inspire Arts & Music. The organization directly appealed to alums and the corps’ fanbase for support, resulting in the receipt of many financial and in-kind donations.